Cytogenetics analysis is a genetic study of the structure of the chromosomes. It includes routine analysis of G-bands by Giemsa staining on chromosomes, and other cytogenetic banding techniques such as C-bands for revealing constitutive heterochromatin. Karyotyping included the process of (1) cells culture, (2) arresting mitosis in metaphase by a solution of colcemid, (3) pre-treating cells in a hypotonic solution, which swells them and spreads the chromosomes, (4) fixation of metaphases for spreading, (5) banding and (6) analysis of the chromosome spread under a light-microscope and arrangement of the chromosome into karyogram. The results are then reported according to the International System for Human Cytogenetic Nomenclature 2009 (ISCN 2009). The minimum recommended quality of banding level will depend on the indication for referral. 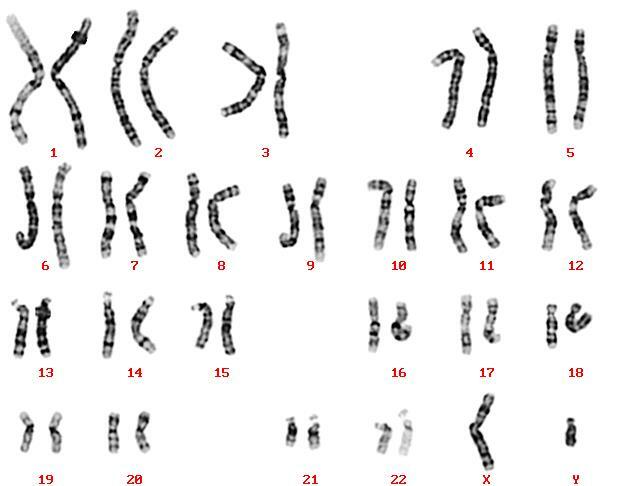 Karyotyping result of an individual consistent with a 46,XY chromosomal constitution.